In the city of Balal stands an archway of stone, a portal that opens doorways to other times and places. Lehkahn the elf pursues his nemesis through this gateway and finds himself in future Earth. 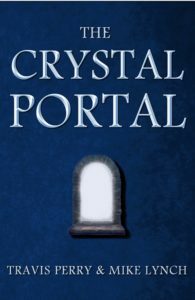 Book 1 of the Tales of the Portal series, fantasy/science fiction for readers of all ages. In the bowels of the city of Balal stands an archway of stone, a portal that opens doorways to other times and places. Lehkahn the elf pursues his nemesis, Sargon Balal, through this gateway and finds himself in the strange world of a future Earth, New Los Angeles. There he meets the robot 9.06, who in spite of his better judgment joins him in the pursuit of their common foe. Yeshua the carpenter sends a boy from first-century Nazareth, Zachariah, to join the elf in his quest. Drawn into a world of crystal, where life itself exists in crystalline form, the three unlikely heroes are aided by Agata, crystal princess and heir to the throne of the Sapphire Monarchy. The future of the crystal kingdom at stake, their struggle against Sargon’s wicked genius will bring suffering almost too great for them to bear. And the portal still stands, linking other worlds yet unknown. Book 1 of the Tales of the Portal series, fantasy/science fiction for readers of all ages.